The number of Americans age 65 and older with diabetic retinopathy is projected to close to quadruple between 2005 and 2050--increasing from 2.5 million to 9.9 million. The number of people age 65 and older with vision-threatening diabetic retinopathy is projected to grow from 0.5 million in 2005 to 1.9 million in 2050. The number of Americans age 65 and older with diabetic retinopathy is projected to close to quadruple between 2005 and 2050–increasing from 2.5 million to 9.9 million. 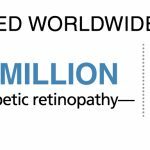 The number of people age 65 and older with vision-threatening diabetic retinopathy is projected to grow from 0.5 million in 2005 to 1.9 million in 2050.